Augsburg's strong Norwegian heritage shows, especially during the holiday season. Once again, it is almost time for the traditional Scandinavian Velkommen Jul celebration hosted by the Augsburg Associates on Nov. 30, starting with Chapel service at 10:20 a.m. and moving to the Christensen Center from 11 a.m. to 2 p.m.
Velkommen Jul is translated as "Escorting in the Season," and it is an annual Christmas celebration you don't want to miss. The event will feature Scandinavian Yuletide music, many tasty treats, handcrafted items, Norwegian bunads, and a visit from St. Nicholas during chapel. Silje Bjelland, a current Augsburg student from Norway, remembers all the different preparations they make back home that lead up to Christmas Eve. "We have an Advent calendar to mark the days," she recalls. "For each day, you open another door in the calendar and some like to have little present or a chocolate there." "We also start baking cakes and cookies, which should be seven different types," Silje explains. 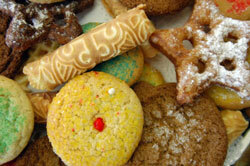 "They are cookies such as 'kvite kakemenn,' 'pepperkaker,' and 'lussekatter' to share with friends and neighbors. 'Julekake,' a popular Christmas bread filled with raisins and candied fruit, is also baked at Christmas." Despite starting their Christmas preparations with Advent, Silje says that some of the fun is saved for the very end. "Many families, as a tradition, decorate their Christmas tree on Dec. 23, which is the 'little Christmas Eve,'" she says. "Christmas Eve is the big day, where the families gather for Christmas dinner in the evening, and after the dinner, we open presents."